In life, Elvis Presley went from childhood poverty to stardom, from world fame to dissipation and early death. As Greil Marcus shows in this remarkable book, Presley’s journey after death takes him even further, pushing him beyond his own frontiers to merge with the American public consciousness—and the American subconscious. As he listens in on the public conversation that recreates Elvis after death, Marcus tracks the path of Presley’s resurrection. 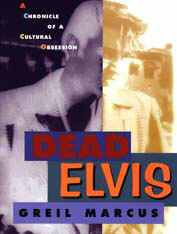 He grafts together scattered fragments of the eclectic dialogue—snatches of movies and music, books and newspapers, photographs, posters, cartoons—and amazes us with not only what America has been saying as it raises its late king, but also what this strange obsession with a dead Elvis can tell us about America itself.